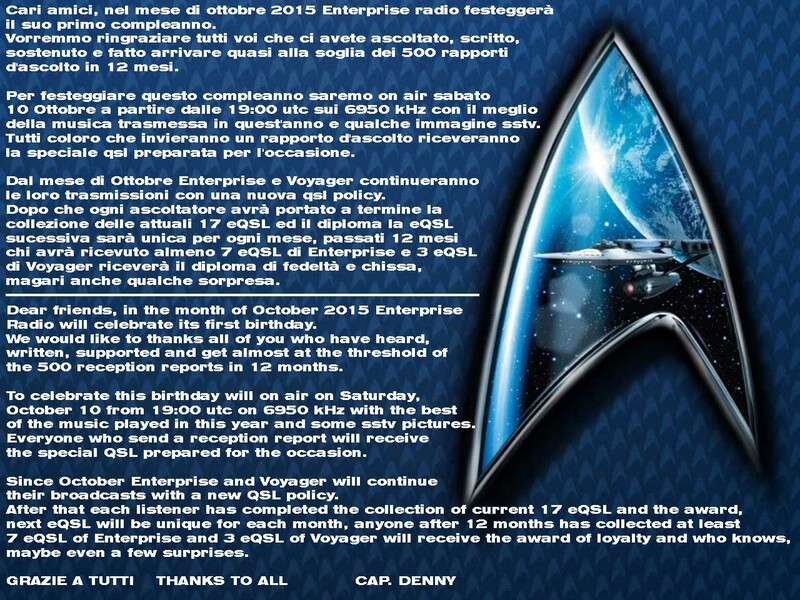 Great eQSL card from Radio 42 for reception report on the 1st October. Bedankt Rob! 1640 @ 2139 Veronica - 34333; "Oh Lonesome Me"
6305 @ 0859 Condor - 34333 ; "Shame, Shame, Shame" by Shirley & Co.
6243 @ 0911 Benelux - 24222; ID via chat, "Silence Is Golden" by the Tremeloes, return of old "pirate" - BNL, Sonny & Cher - "I Got You Babe"
6305 @ 1808 Powerliner - 45544; Polka from Ansambel Maksa Kumra, ID, greetings to me. 3935 @ 2042 Rainbow - 34222; Speaking about email adrress; ID, Phil Collins "Take Me Home"
LFR was heard in New Hampshire, USA around 2130 UTC, best report around s4-5. Not too bad! 6285 @ 1750 R Northern Ireland - 45433; "Bodies" by The Smashing Pumpkins, Relay by Python? 3905 @ 2145 Polaris - 22222; "War" by Kensington, "You Ain't Seen Nothing Yet" by Bachmann Turner Overdrive, @ 2156 34333 with Jethro Tull & "Locomotive Breath"
48 m closed about 2030 UTC which is even better than the past two days... will it continue? 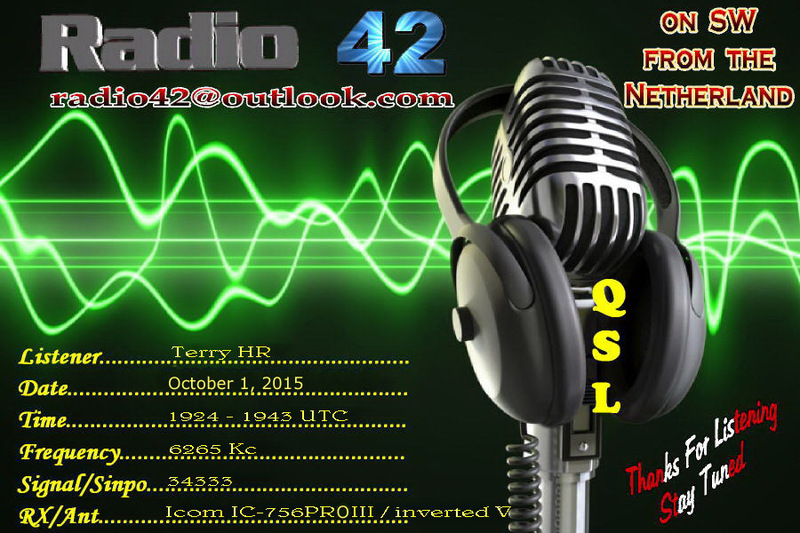 Great eQSL from Pink Panther for reception on 6803 kHz. Thanks, PP! 6285 @ 1631 Bogusman - 45544; "Take It Easy", usual Bogus chat, Graham Parker & The Rumour "Hey Lord, Don't Ask Me Questions"
6395 @ 1756 Pioneer - 3-45444; U2 - "I Still Haven't Found What I'm Looking For"
The 48 metre band stayed open for short skip until around 1845 UTC again here, which is a bonus after the last few weeks! Interestingly, the K index was 2 today and the band was open until at least 1845 UTC here, maybe later. Hopefully the band will settle down, if we have more stable solar conditions. 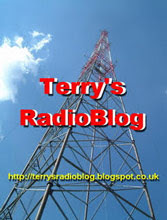 6265 @ 1612 Radio 42 - 35444; ID in various languages. It was good to hear strong signals on the 48 metre band this afternoon, but the band is still closing for short skip before dark. Whether this will change, we shall see in the next few weeks. 17th October 2015: 08.00 to 09.00 UTC on 9510 kHz via IRRS. The 48 metre band closed for short skip at around 1630 UTC again, but re-opened after dark for a short while and closed again around 1800 UTC. 6325 @ 1738 Goofy - 24222; Donatan feat. Borixon, Kajman - "Nie Lubimy Robić"
The 48 metre band closed again before dark for short skip. All Dutch stations disappeared before 1700 UTC. Goofy at 1738 was the only station audible. 6394 @ 1544 Studio 52 - 24222; Music, but started to fade out. No short skip again today and fluctuating medium skip in the afternoon and early evening. Pink Panther was in and out of the noise, fluctuating from s9 + 20 to s0! The band closed early for medium skip; around 1730 at this location. Another evening of strange conditions; no short skip and medium skip very poor. Heard Telstar on 6262 around 1615, but before I could log anything the signal had gone into the noise. 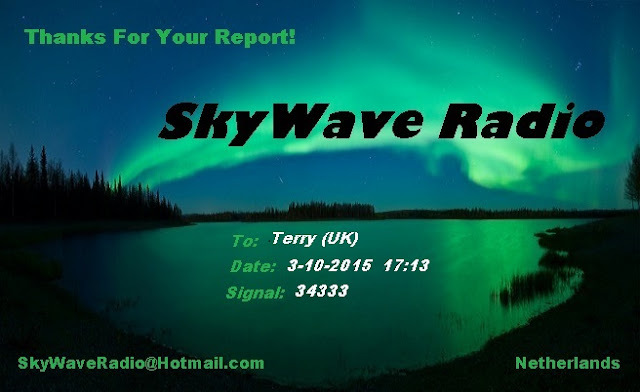 It was good to hear some signals on 48 metres again after another period of solar flares and no short or medium skip on the band. 4026 @ 1817 Laser - 45434; Talking about Twente SDR, Future World Orchestra & "Desire"
Dire conditions on the band this evening. After hearing Hitmix the band took a dive and short skip went completely as a result of earlier solar activity. 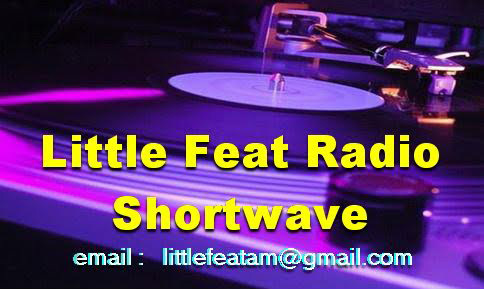 The station is running low power in the 48 metre band and has just begun transmissions on the shortwave. Thanks Skywave for the quick reply and great QSL! The band was variable today; short skip conditions were non-existent all day up to around 1815 UTC. Signals were then very strong, but few stations were on the air, no doubt expecting poor conditions. The band closed early for short skip. 6265 @ 1603 Digital AM - 35434; The Everly Brothers & "Walk Right Back"
6325 @ 1838 Etherfreak - 24222; Billy Ocean & "When The Going Gets Tough..."
6200 @ 1841 Technische Man - 45434; ID and "Beautiful life" by Ace Of Base, UB40 & "The Way You Do The Things You Do"
Band started to close for short skip around 1950 when I lost English stations; I had lost all Dutch stations by 2025 UTC, except for Technische Man on 6200. 6285 @ 1938 Focus - 45434; Rainbow & "Freedom Fighter"
The 48 metre band closed here at 2045 suddenly for short skip. But ... that is better than last evening when it was 1930 UTC!